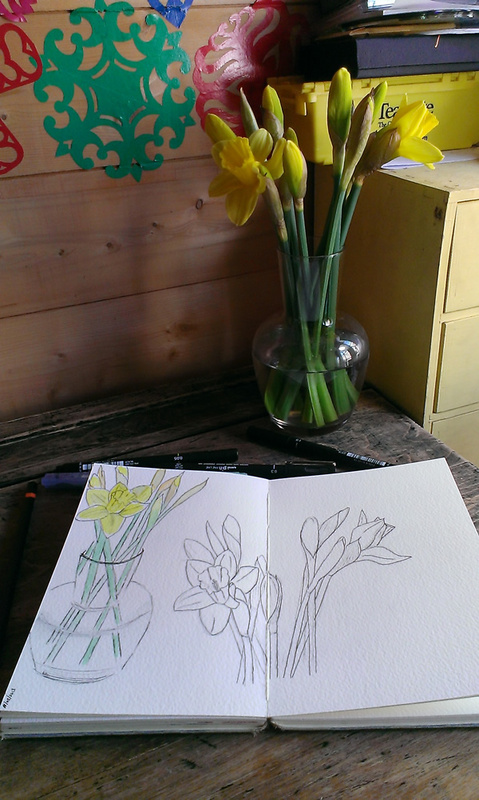 Week three of the daffodils… I think they might finally be on their last legs! 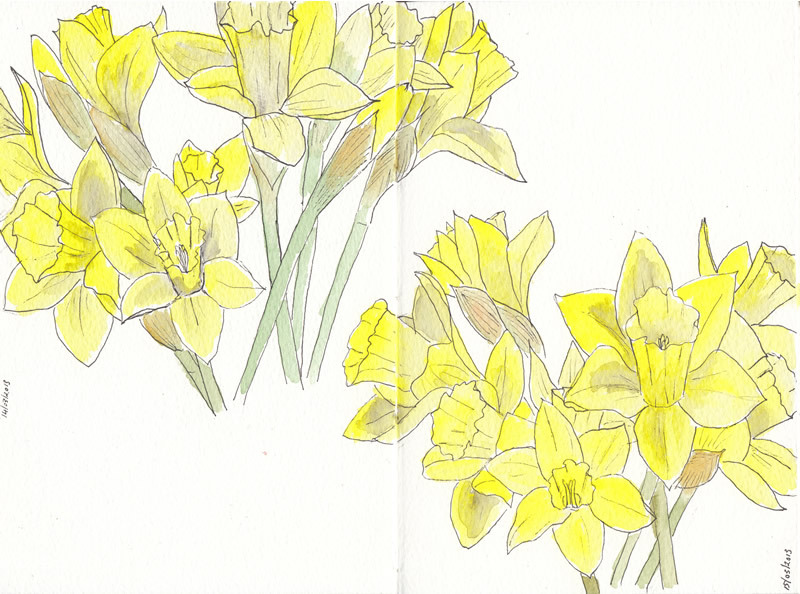 For Easter greetings visit Jenna at Timballoo and see what she’s got in her sketchbook this week. It’s been over two years since my last thread about redecorating. That’s a long time, and the reason for the delay is Brent Council: we began the process of purchasing our loft space from them in January 2011, and because converting our loft will involve dropping the ceilings in the rest of the house, as well as potentially removing two chimney breasts, we decided not to do any more redecorating until after the loft conversion. We really, really didn’t think it would take the council over two years to complete the matter, but it has and we are still waiting. To say I’m unhappy about this is possibly one of the biggest understatements ever. 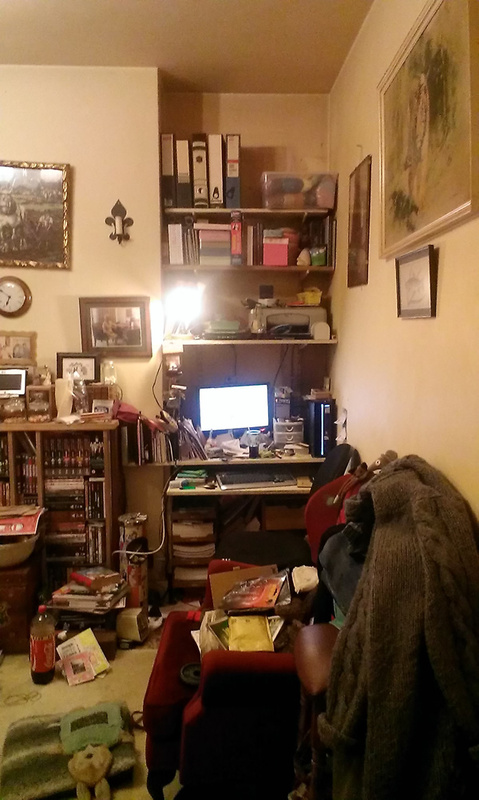 Yes, I know it’s a right mess. 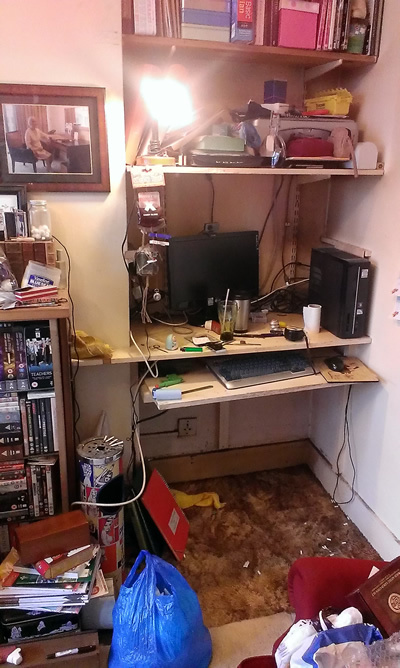 It hasn’t been repainted in years, and that desk in the corner has been there about twenty years (my dad built it for me when I got my first computer)! 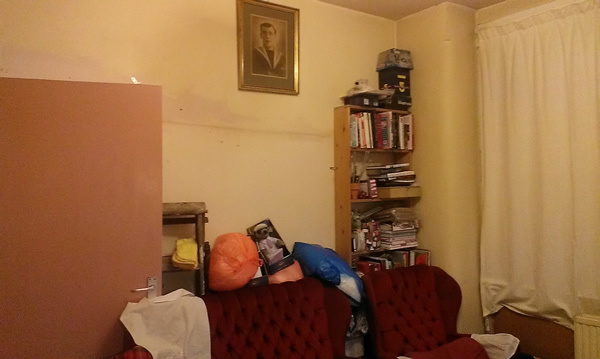 Definitely time for decluttering and redecorating. 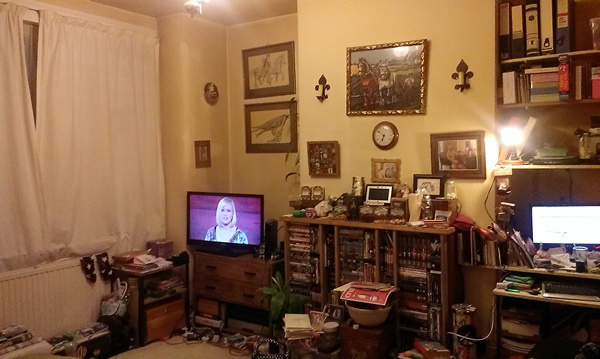 I cleared everything out, was briefly horrified to find that my mother hadn’t even bothered to take the picture down last time she repainted the room (I still can’t believe that she just painted round it! 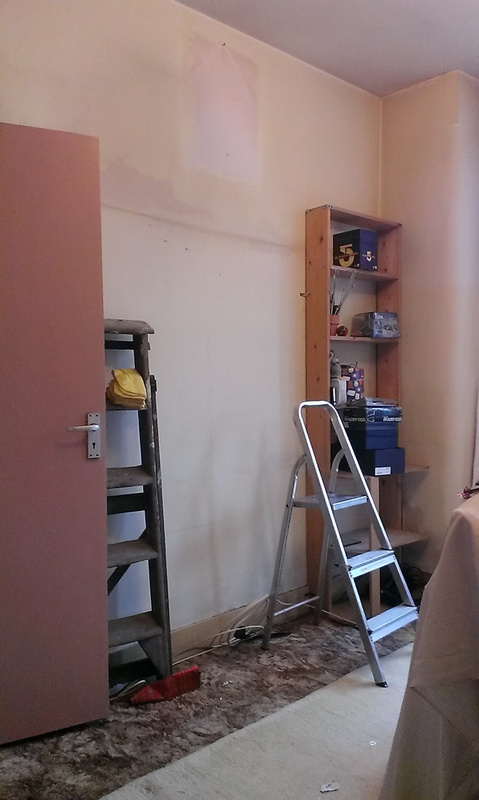 ), then got to work filling holes, stripping down the skirting board, washing the wall, and generally prepping things. 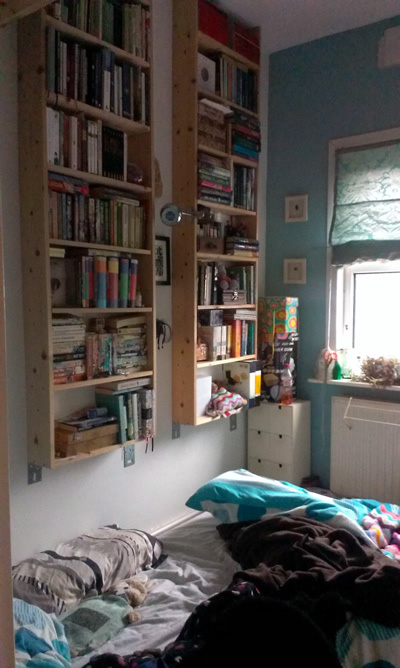 I took down that shelf (built by my dad to hold a mixture of books and records) and replaced the three big shelves with new ones to match the others and reduce the depth of the whole unit. 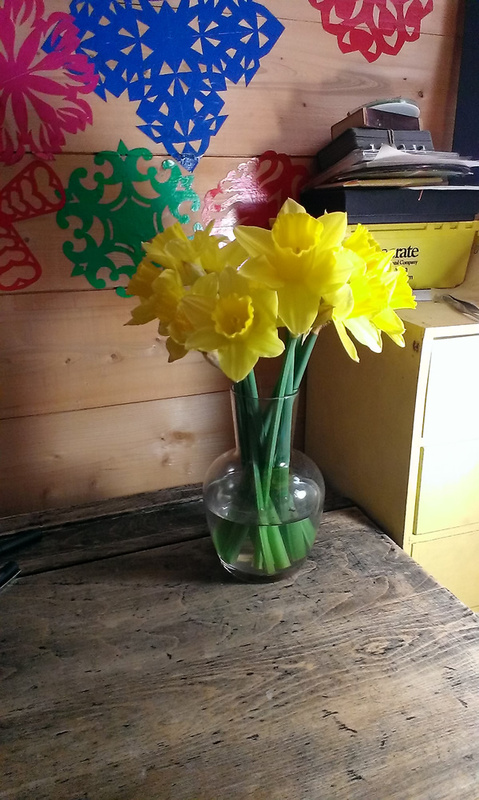 …and moved them into the sitting room. 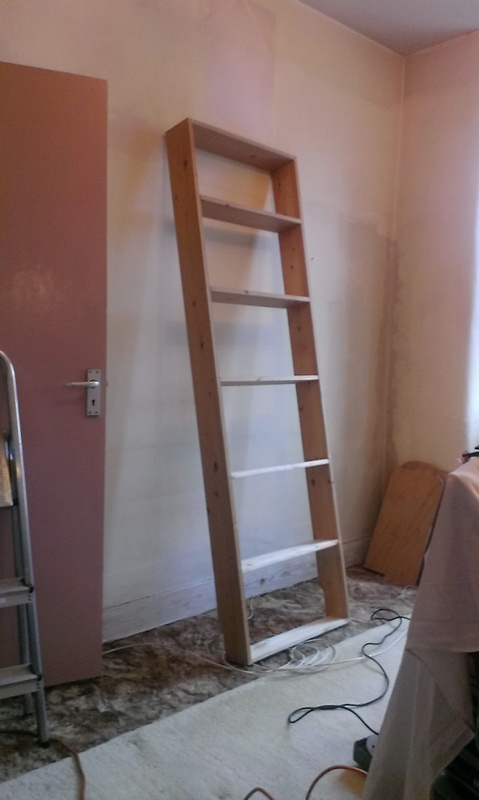 In between all this I gave the wall a good couple of coats of a nice light cream/white (Wickes chalky flat matt in Harvest Moon). That was day one of the project, and it was a good start. 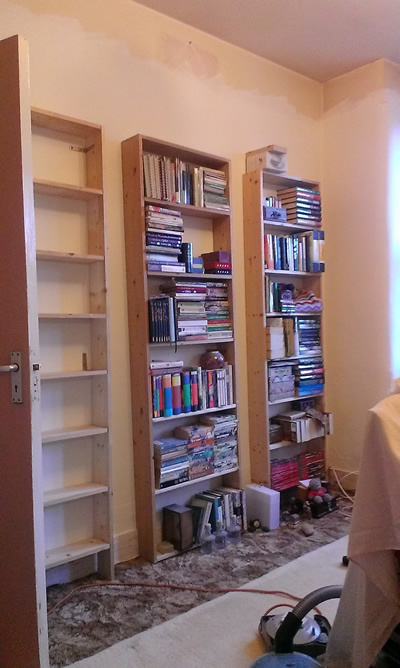 Of course it meant that we no longer have any shelves in the bedroom, but we’ll get back to that later! Day two saw me attacking my desk area. It’s served very well over the years, but it’s a bit too bulky and I have a tendency to keep a lot of clutter on my desk as there’s so much room. With the advent of flat screen monitors I haven’t really needed such a deep desk for years, and so I decided to reduce the overall size of the desk, make the plugs less visible, and generally give it a cleaner look. A while back I was lucky enough to gain a whole load of shop fixtures from Lush when they closed their shop on Portobello Road. 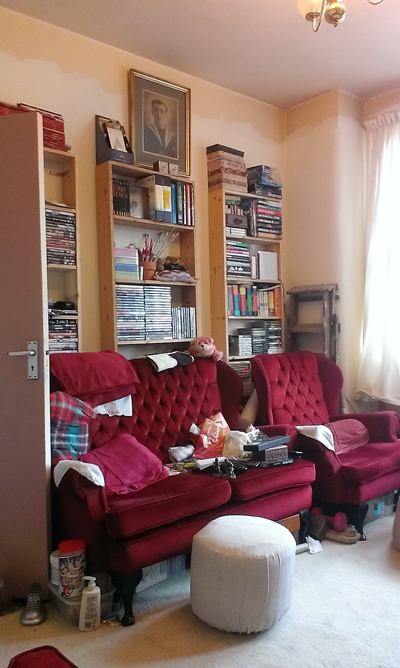 Loads of shelves, a trolley (which now lives in my studio) and a couple of tables. Some of the shelves have already been put up in the kitchen, but the rest have been saved very carefully for this very occasion. 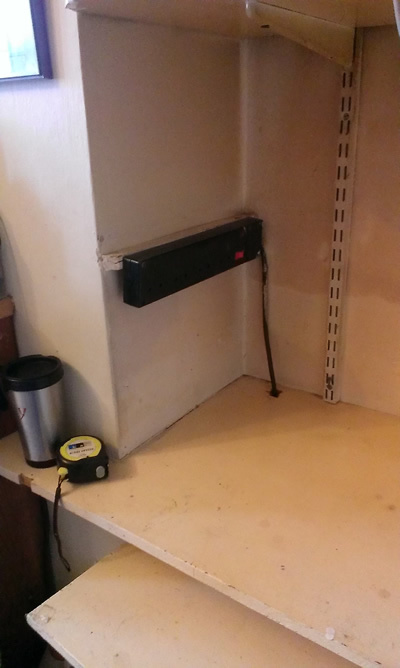 I used one of the large corner shelves leftover from the kitchen to create a new desk, and then (with the aid of an enormous drill bit and some special supports) turned some others into floating shelves. 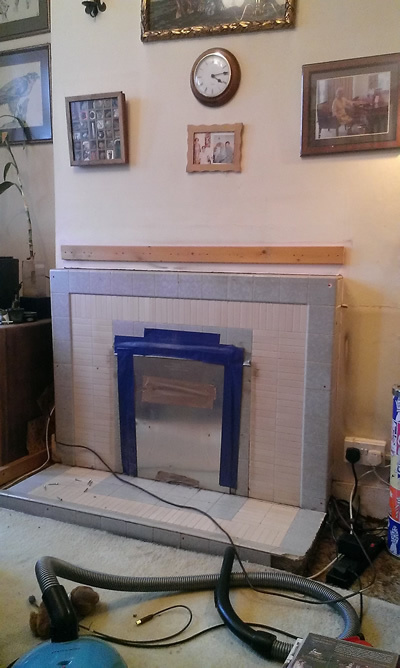 Isn’t that fireplace VILE? You can see why we covered it up! Time to get rid of it once and for all. 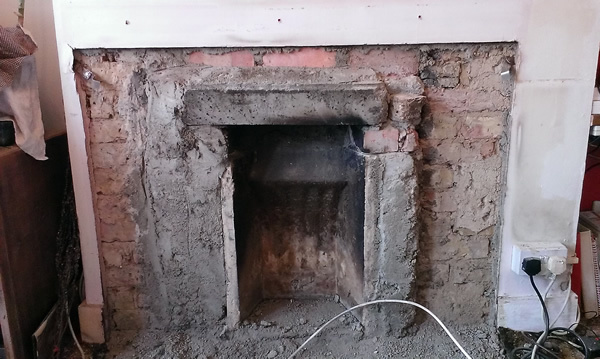 That’s about as far as we’ve got with the fireplace, the rest will be removed hopefully this coming weekend and then we’ll get a plasterer in to cover up the hole and make good. 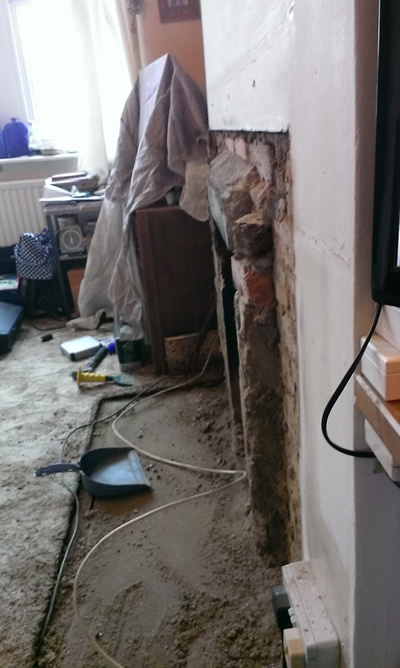 For now we’ve moved the television to sit in front of it (the TV will eventually be mounted on the chimney breast, so we’re taking the opportunity to have the telly there and raise it up on bits of wood until we work out what height we want it at), which suits us well for the time being. 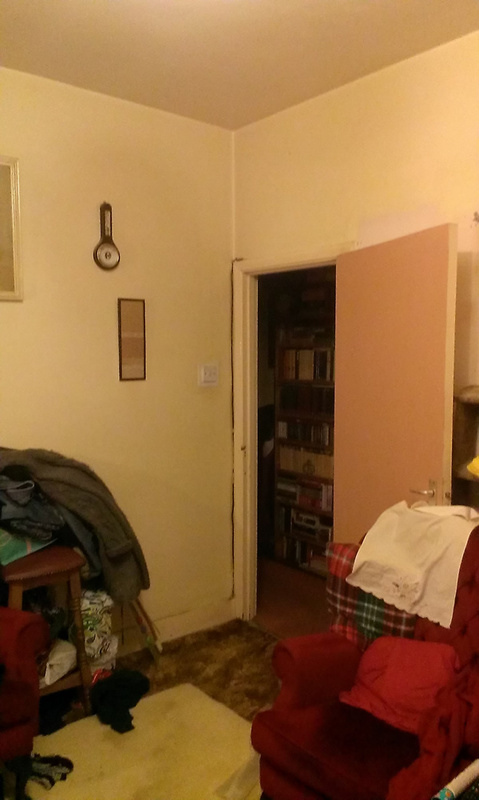 Onto the last corner of the room… which is now also home to some floating shelves, and as there’s now room on the floor we’ve moved some boxes into the space for now. 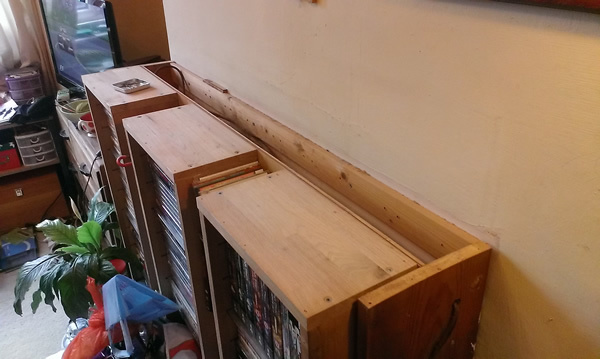 Some of you may remember that I bought a lovely vintage trunk from a boot sale a while ago – it’s currently in storage elsewhere, but eventually it will go into this alcove. So, it’s about time you saw the final photos! It looks so much bigger! 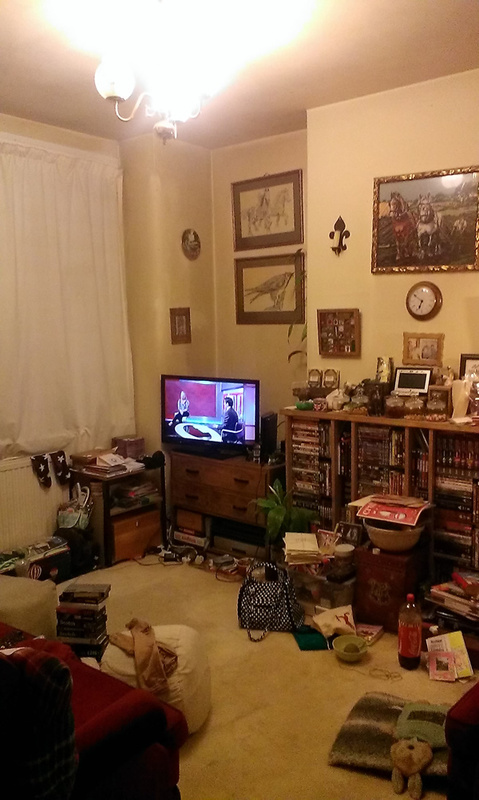 Despite moving that chest of drawers and the TV in front of the chimney breast there is actually loads more room, and it feels so spacious. 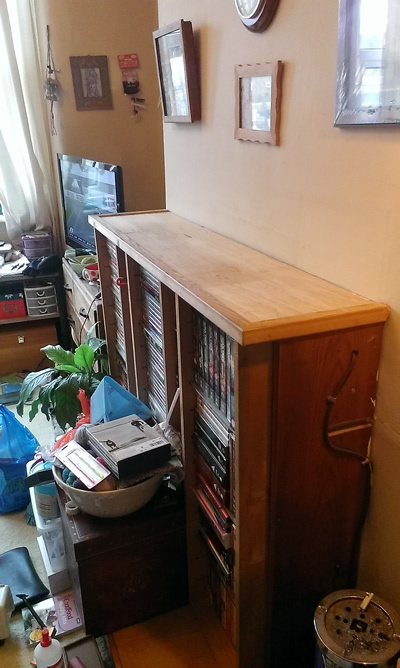 Decluttering and throwing out a heap of stuff helped, as did tidying up 😉 We’ve moved one of the tables from Lush in there temporarily (although it’s eventually destined for the kitchen), and the chest of drawers will stay there until the loft is done and we’ve got somewhere else to put it. 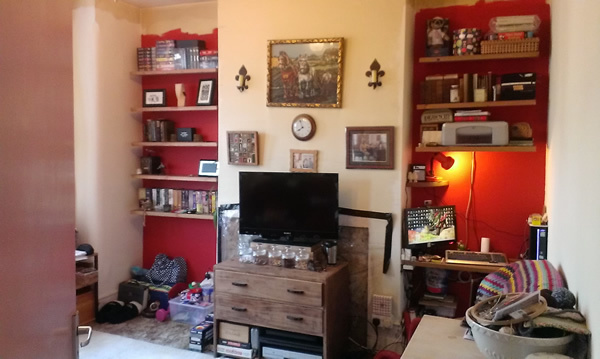 Aside from finishing off the chimney breast (and recarpeting, but that’s a post-loft job), though, this room is pretty much done (and you’ll note that I left the top 30cm of the room undecorated as that will all be hidden once the ceilings have been dropped!). I love it, mum loves it, and Matt loves it – so it’s a job well done, and despite being absolutely knackered now I am very happy. Can’t wait to start on the rest of the house now! Oh, I suppose you’re wondering what happened to the little bedroom after I stole the shelves? 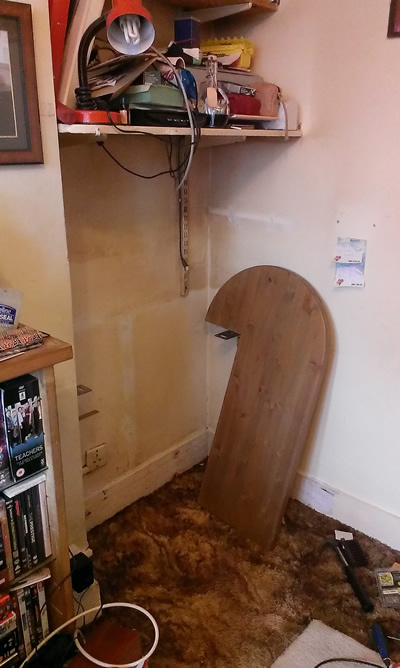 Well, the shelves were replaced with the ones that were in front of the chimney breast. 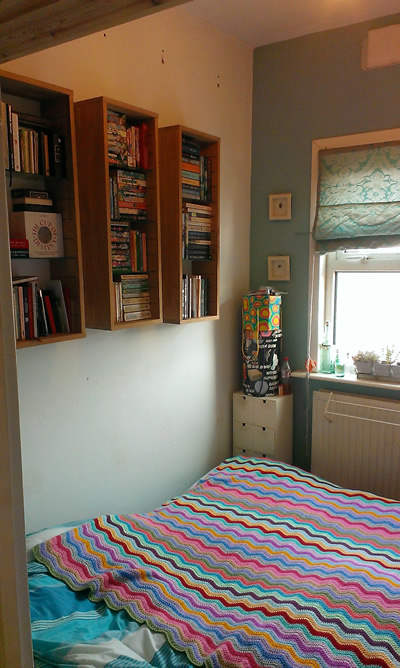 For those who like to know these things, I set myself a budget of £300 to complete this room and came in just 69 pence over that. 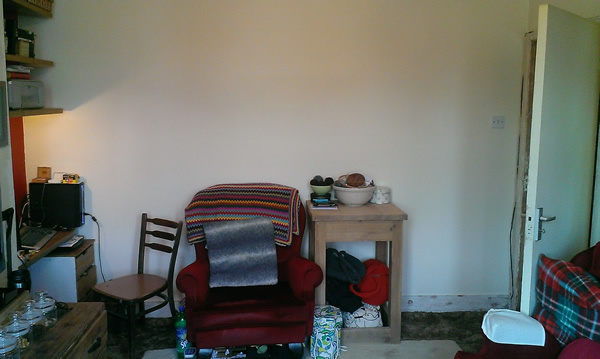 Not bad, and it included paint, fixings, and a Hippobag for removal of the waste from the fireplace. 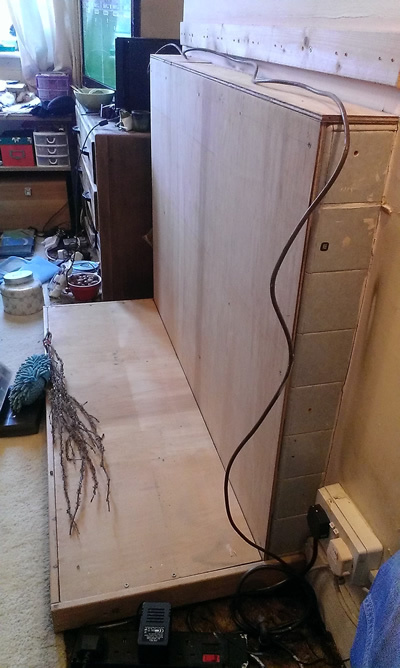 The timber for the shelves and my desk was, as mentioned above, obtained for free, and the other shelves were all just moved from one room to another. The wooden chair which has replaced the ghastly office chair was found on the street (I seem to attract chairs, this is the fourth one I’ve found in the past two years!). 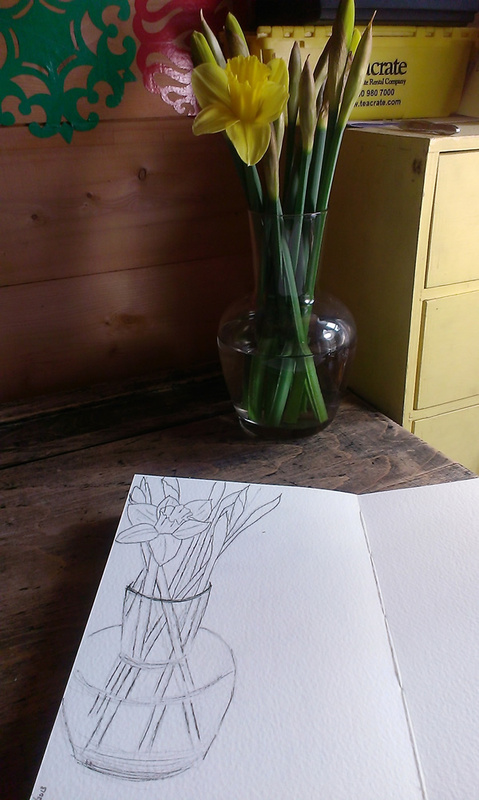 I do like working with a small budget, the challenge makes the whole process far more interesting for me! I hope you’re all keeping warm during this unseasonal cold snap – it really is bitterly cold out there at the moment! I’ve been keeping warm indoors by spending most of my time frantically decorating over the past week, but have also squeezed in some time for knitting. At the Spring Knitting & Stitching Show (which ran from 14th-17th March at London Olympia) I fell in love with a bag by Toft Alpaca. Gorgeous, isn’t it? Unfortunately it was well out of my price range, coming in at a grand total of £122. Ouch! However, the very helpful woman running the stall told me that they sell kits (which include the yarn, pattern, kntting needles and giant button) for £100. That’s still pretty expensive in my book, and frankly if I had that much money to spend on a kit then I might as well spend the extra £22 to get someone to knit it for me. Mercifully she also said that they sell the pattern and buttons on their own. Aha! I left the show that day and immediately started the hunt for a suitable yarn substitute. A yarn substitute was the most important part of the planning process, as it’s the cost of the Toft yarn that’s the real killer. It’s beautiful, and it’s proper alpaca yarn bred and manufactured here in the UK… but it’s £25 per 200g ball. 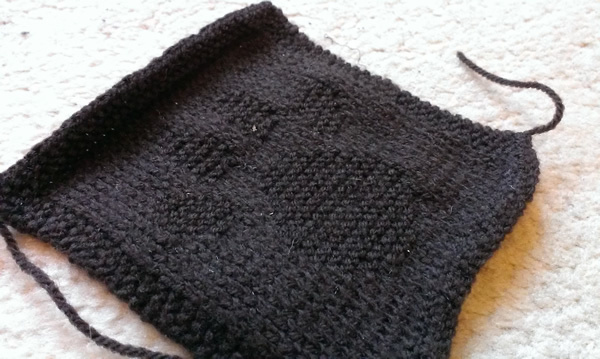 The pattern reckons you need 800g of their chunky wool… you do the maths. So I needed to find a pure wool, suitable for felting, which was of the same weight (the Toft stuff is labelled ‘chunky’ but is actually more like ‘super chunky’). I hunted around online and eventually found some yarn I thought would work, so I ordered some of that (more than I thought I’d need, just in case! 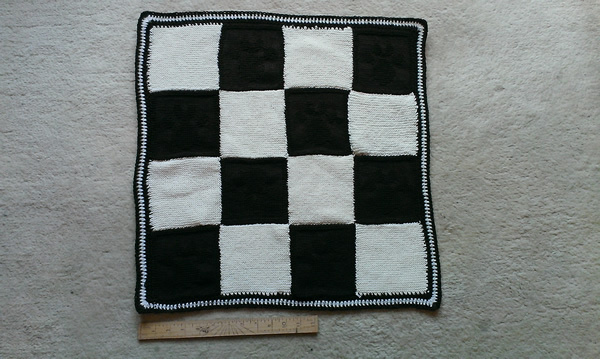 ), then went to the Toft site and ordered the pattern, button and needles. I then waited rather impatiently for everything to be delivered. I’ll be honest, the knitting needles scared me a bit when they first arrived – they’re HUGE! Still, despite some awkwardness to start with I soon got to grips with them and discovered that the pattern was very quick to knit. I did have to use a small carabiner as a stitch marker, but that just adds to the charm of the project I think. It had shrunk a bit, but not enough, so it went back in for a second wash at 60 degrees. Much better. I then stuffed it with carrier bags to help shape it, and hung it over a radiator to dry, and then once it was dry I added the giant button. I love it. It’s turned out beautifully, and although it’s more textured than the Toft bags I do actually prefer it this way. It was really good fun to knit, and a wonderful birthday present as my lovely fella paid for the yarn and notions for this project. My birthday isn’t until April, but hey – if you have to knit your own present you might as well have it early! 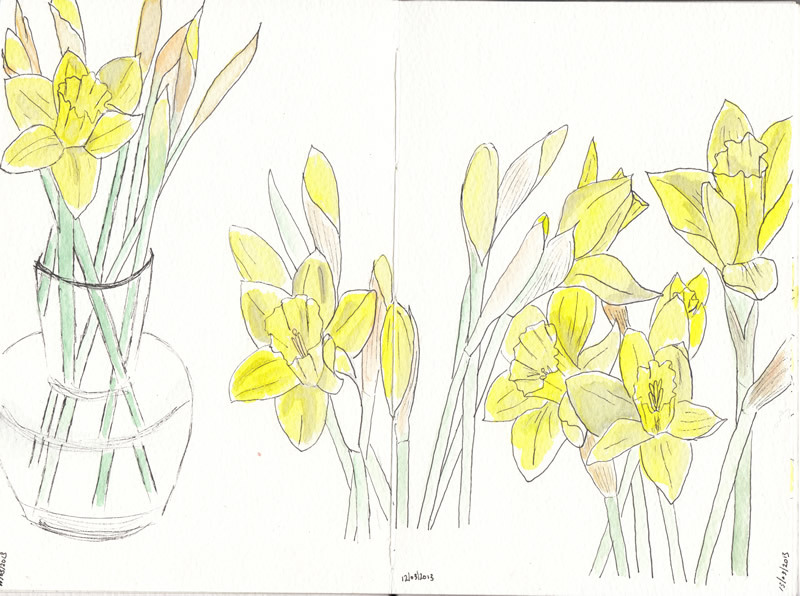 Well, last week there was a flurry of activity in my sketchbook, and I had hoped for the same this week… but it turns out that the first week of the daffodils was by far the most exciting, and I’m also coming to the conclusion that I’ve bought magic daffodils that are refusing to age and die. 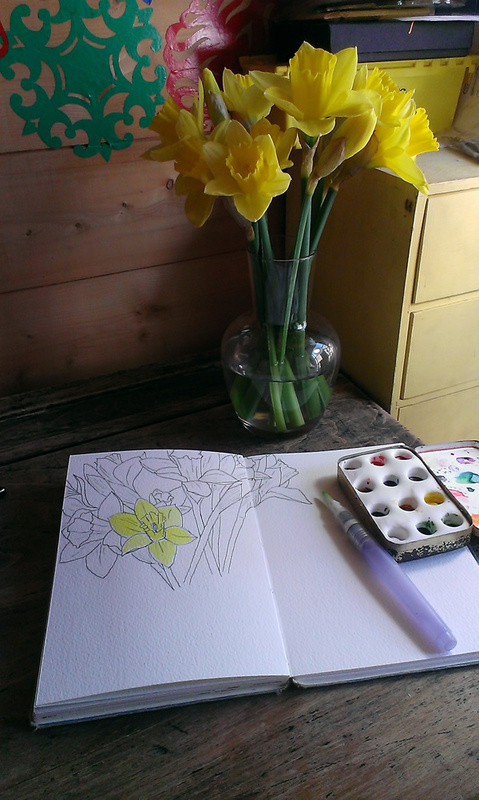 I trust you’ve all had a good week, and hopefully Jenna has got over her lurgy now and has something new to show off! 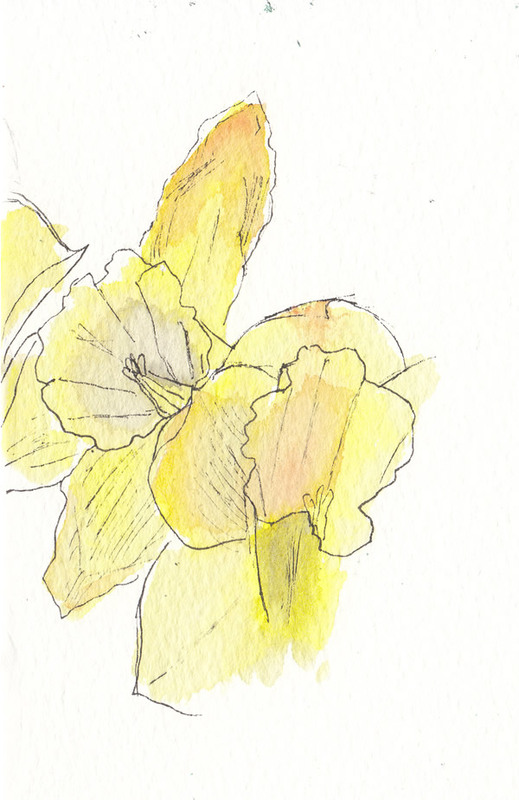 I’m juggling quite a few projects at the moment, and have been kept so busy I’ve not had time to blog properly, which is a wee bit frustrating! 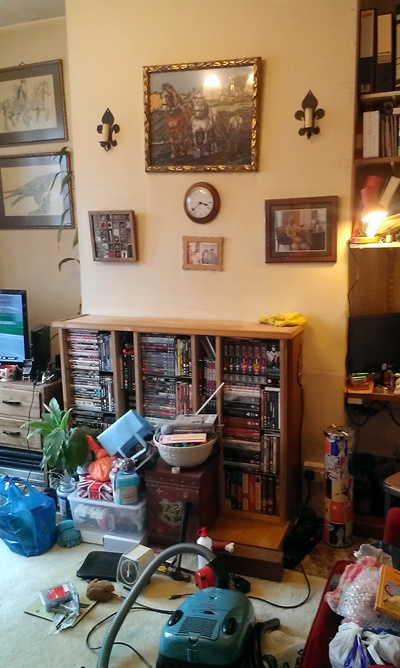 The biggest project is redecorating/revamping my sitting room, which is going to take about a month (I need to do it in stages or it will be utter chaos as this is a very small house), and I will blog about that once it’s properly finished. 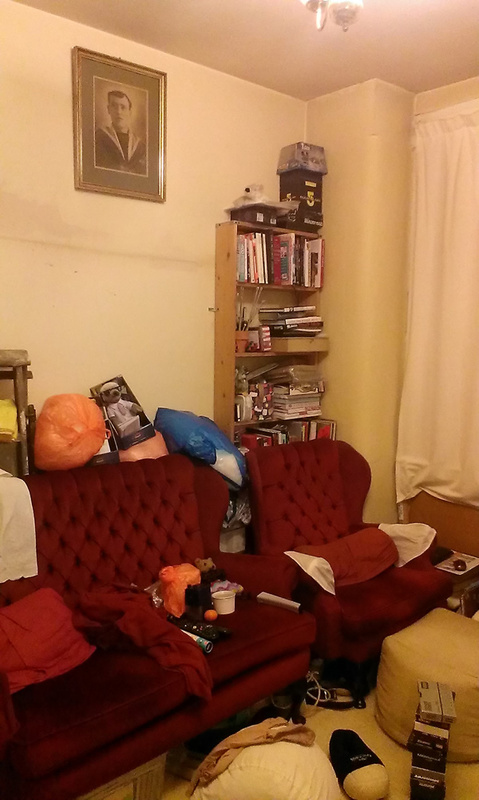 One of the things about decorating is that you inevitably have to declutter as you go. This is no bad thing, particularly when you’re as much of a hoarder as I am. 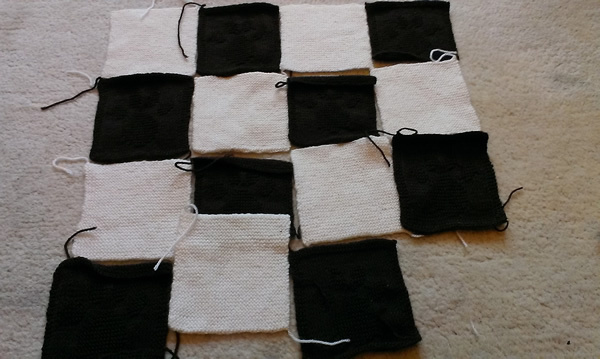 Amongst the many, many, many random bags of stuff I found a bag of knitted blanket squares. It’s been so long since I made them that I can’t remember when I started that particular project, but I’d hazard a guess that it was at least four years ago. That’s as far as I got with that particular blanket, and I abandoned it because it took so long for me to knit a single square – I’m very slow with regular knitting needles (although I’m very speedy with DPNs, strange but true), and although the cream squares are just plain garter stitch, the brown ones are patterned. 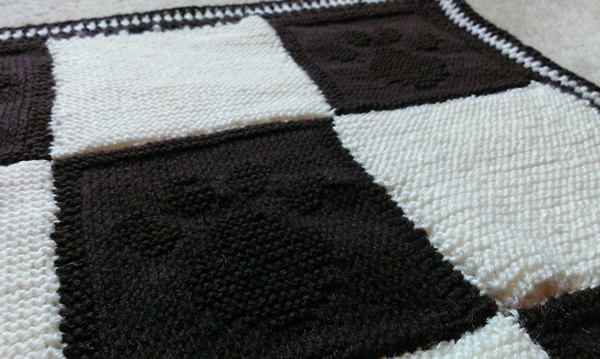 It’s a teeny tiny blanket, no use to a human, but I’m going to put it away safely and hopefully one day it will be a blanket for a pup of my very own! Another busy week here, topped off with a weekend of decorating and DIY, and to be honest I am so tired I’m amazed I’m managing to get this blog post out on time! 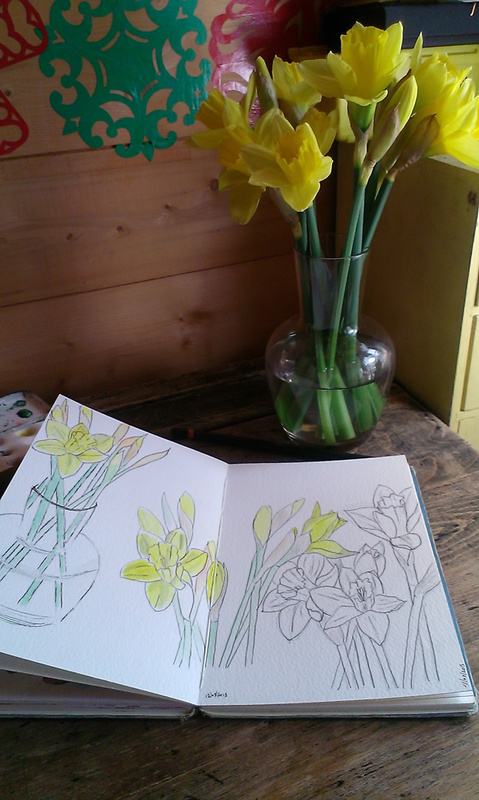 I loved Jenna’s sketch of an apple at various stages of being eaten, and so my little sketching project this week has been a vase of daffodils. 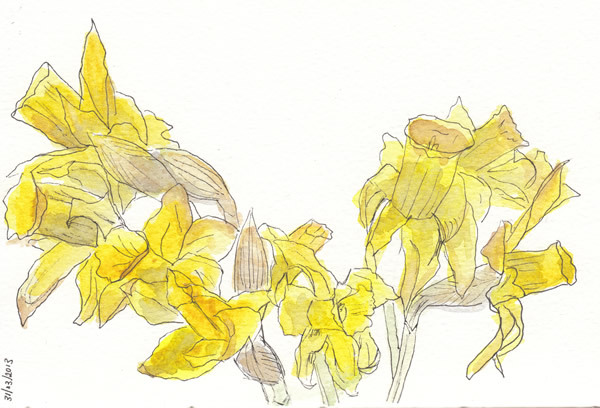 I’ve been sketching them each day at around the same time, and having started on Monday I’ve only missed one day (yesterday). 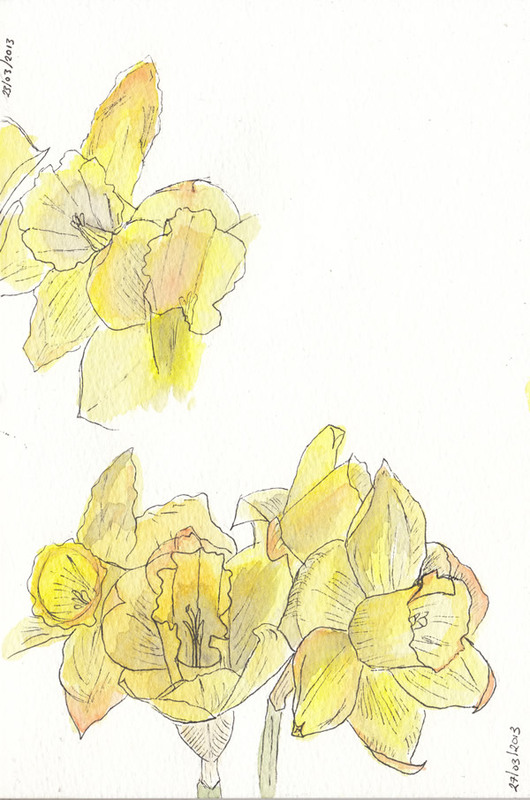 I did actually haul my tired backside down to the studio very late last night with the intention of getting another sketch done, but upon close inspection the flowers hadn’t changed: it’s the first day all week that there’s not been a marked difference in them – clearly fate was smiling on me! 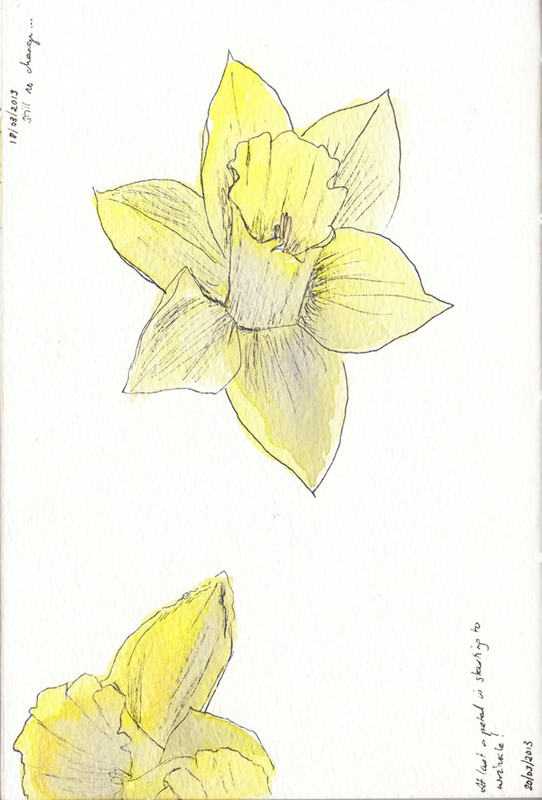 It’s my intention to continue charting the progress of the daffodils with a daily sketch until they fade entirely, so wish me luck! 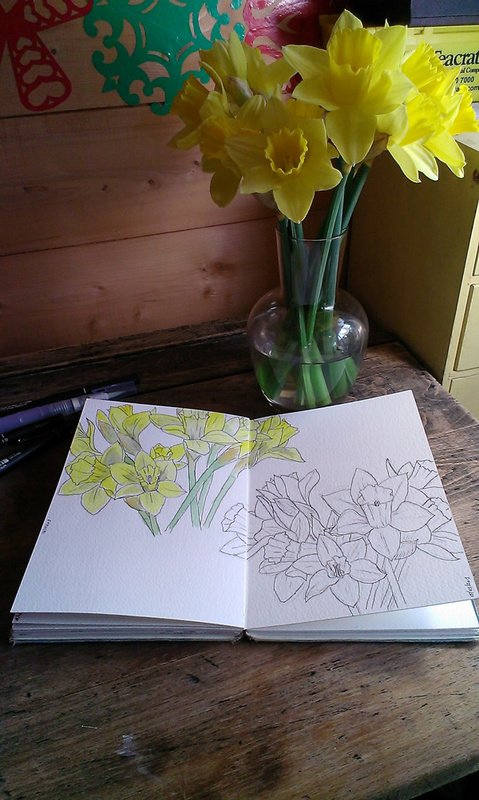 If you’ve enjoyed this post then please visit Jenna and Hayley to see what they have in their sketchbooks this week. 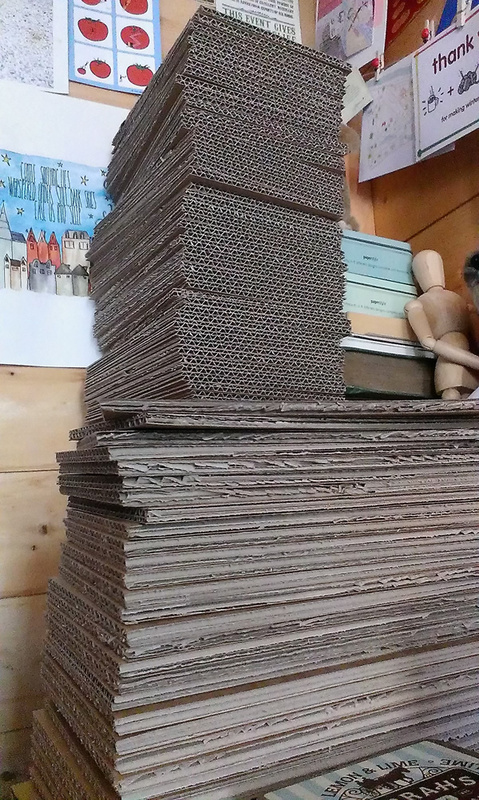 I’ve spent a vast amount of time cutting up cardboard boxes so that they’re ready to turn into trinket boxes. I always use old cardboard boxes to make the layers as they’re free, which helps keep costs down, and of course repurposing/recycling is always a good thing… but finding the right sort of cardboard box is trickier than you’d think. Ideally I like to use boxes which are quite thick, and not printed with anything too garish in case it shows through the envelopes – and whilst my local shop is happy to supply me with boxes, they aren’t always suitable. Anyway, I’m waffling a bit but basically at the weekend I ended up with two ENORMOUS boxes from IKEA, as a friend was throwing them out. 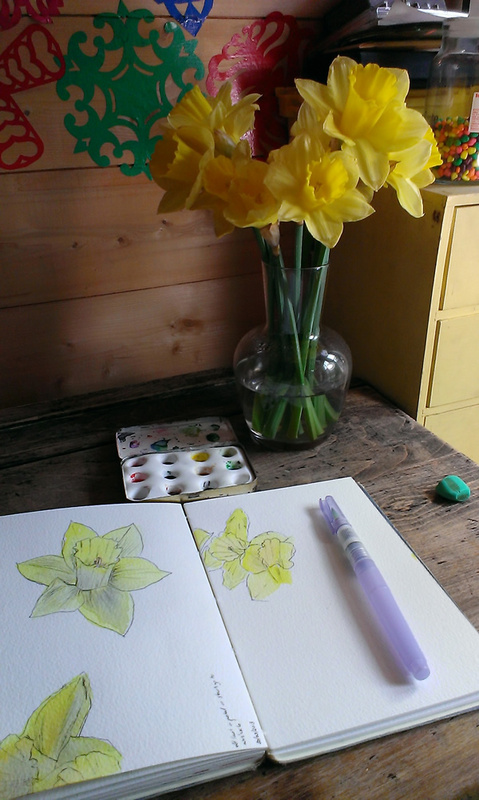 They were too perfect to turn down, so I took them home… but they filled my studio entirely. Not good! Thus I have spent the best part of two days chopping them up into the right sized pieces, and then desperately trying to find room to store those pieces. I’ve not been entirely successful, as you can see from the photo above I’m surrounded by towering piles of cardboard. There may well be a promotion on trinket boxes running in my shop very soon! 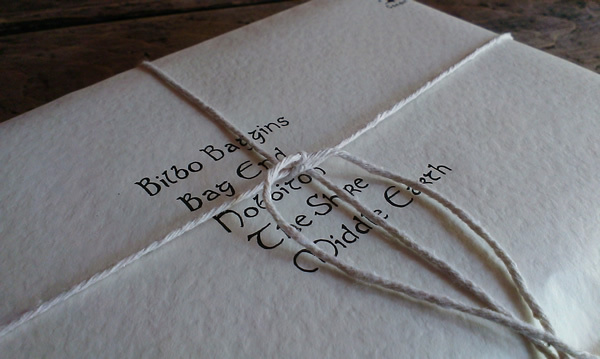 I have made a start on making some boxes though, and the first to emerge this week was a Lord of the Rings/Hobbit themed one. I want to make some Discworld themed ones too, but am currently stumped as to where I’ve put my Discworld stamps. Hmm.